The year 1865 marked the apotheosis of the golden age of "conquering" the summits of the Alps, and the Piolets d'Or 2015 will be the occasion to announce a series of commemorative exhibitions and events, which will punctuate the summer season 2015. For serious modern alpinism, in view of the astonishing climbs achieved over the last quarter of a century, one could legitimately consider that the Golden Age of "alpine style" on the highest summits of the planet is now. How far are mountaineers willing to go? After 2012 and 2013, two exceptional years for remarkable achievements, the year 2014 has seen a break, probably due to the geo-political context. The adventurous mountaineers have shown themselves to be less timid than the classic tourist, but the tragedy of the Nanga Parbat base camp in June 2013, as well as the assassination of French mountain guide Hervé Gourdel, in Algeria last September, have really affected the climbing and mountaineering community. Despite this difficult context, remarkable achievements have been numerous and the spirit of an alpinism committed to exploration remains intact. This year, the Piolets d’Or have assembled an international technical committee made up of nine top-class mountaineers, originating from nine different countries. The committee is responsible for selecting- with total freedom and independence- from among the 2014 expeditions which correspond to the Charter of the Piolets d’Or, which will be honoured in April 2015, in Chamonix and Courmayeur. 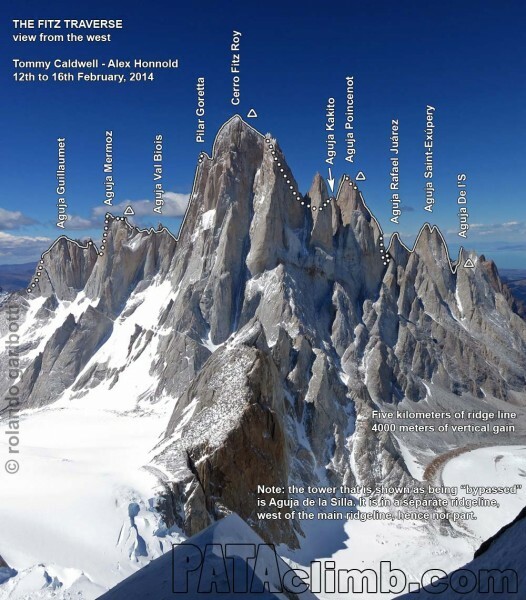 Argentina, Patagonia (3,405 m) From 12th- 16th February 2014, Tommy Caldwell and Alex Honnold succeeded in completing the full traverse of the range, from north to south. They had to climb seven summits: Aguja Guillaumet, Aguja Mermoz, Cerro Fitz Roy, Aguja Poincenot, Aguja Rafael Juarez, Aguja Saint-Exupery and Aguja S, a total of 4,000m of ascent, a maximum grade of 7a, with ice sections at 65°. Such a traverse could only be contemplated by very fast climbers. 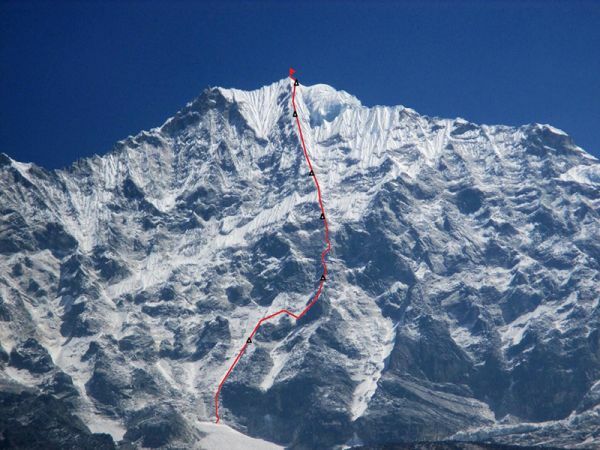 Alexander Gukov and Alexey Lonchinsky (Russia) have opened up a route on the South Face, at 1,620m. Their route, which required six bivies, has been named Shy Girl. 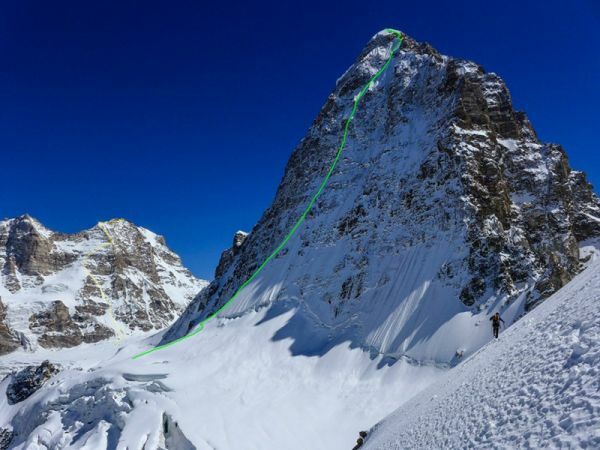 Ales Cesen, Luka Lindic and Marko Prezelj (Slovenia) opened a route on the North face of 1,350 meters high, ED, ice at 90°. The steepness and difficulty of the ice forced them to climb until two o’clock in the morning, on the first day. They summited the next day, 30th September, at 5pm, then descended by the original route, first opened in 1989 by Polish climbers.